Description: Hello, there. This is my first puzzle that I have made. This level was actually made before I found Ver. 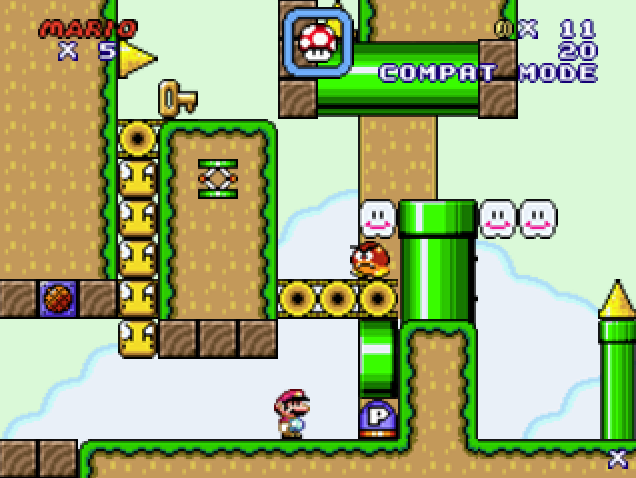 C. of Super Mario Flash 2, so I didn't have many features, like bobombs, one-way gates, etc. I did use what WAS available, though. Have fun solving the puzzle, and I will be posting many more puzzles to come. Also, you're probably wondering why this isn't in a group of puzzles, and why it's just standing as one. The reason being is that it's more than one screen and is more complicated than a one-screen puzzle, so I just want the player to have the satisfaction of solving this one puzzle. Update: Fixed the cutoff at the top of the level. Don't know why it matters, though, since when playing the level, you can't see it anyways. Very nice, very nice indeed, requires some heaving thinking for me, although not much scenery so -3. Lastly, please do add some scenery (e.g. bushes, trees, etc for an overworld level) to make this level look more interesting. Understand that trying to invest your time to play and rate an SMF level is not easy. The scenery is what gives any level that extra spark when it comes to level design. this level was quite confusing. I don't even know where to go next! and there's a flaw with the ground at the top. you didn't use the whole area.